But there are other ways to celebrate gratitude — although we know such celebrations should be every day. I am not light on my feet, and my usual dance partner is a camera tripod, so I might simply be observing this . 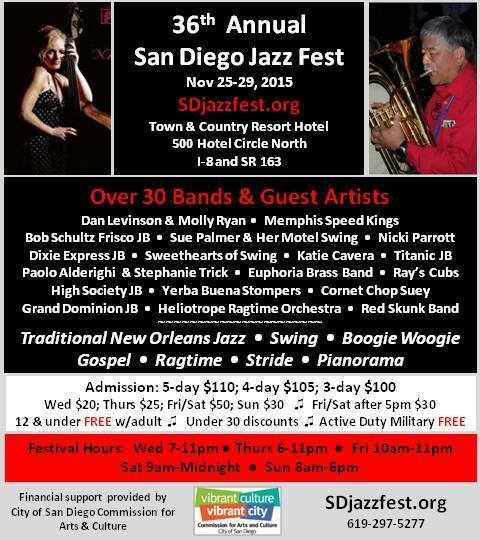 . . but please note that it is just one part of the very pleasing San Diego Jazz Fest — which has been my Thanksgiving celebration for the last five or six years. Ray, Marc, Dawn, Carl Sonny Leyland, the Yerba Buena Stompers, David Boeddinghaus, Paolo Alderighi, Stephanie Trick, Grand Dominion, High Sierra, Kris Tokarski, Lakeshore Syncopators, Chloe Feoranzo, Hal Smith, Virginia Tichenor, Katie Cavera, John Gill, Marty Eggers, and more. But you don’t have to imagine who might be playing and singing: you can visit here — with colored markers — to begin arranging a weekend of Thanksgiving pleasures, including parasol parades, brass bands, rockabilly, zydeco, and other dishes. More about the bands here, and the crucial page — how to buy tickets! — here. The whole website lives here on Facebook. You’ll be grateful, I promise you. So much more refreshing than carb-induced slumber, sports on television, and a week of turkey sandwiches, getting less appealing by the day.